Someone inside the senate is not much a pro to NSA’s whistleblower Snowden as they are using the platform of Wikipedia to express their view point. The page at Wikipedia which describes all about Edward Snowden who is known to have leaked many classified files of NSA has been revised on many occasions since he first started sharing of confidential files back in June. Among the recent and talked about revisions has been the one which came from inside the senate building of the United States. 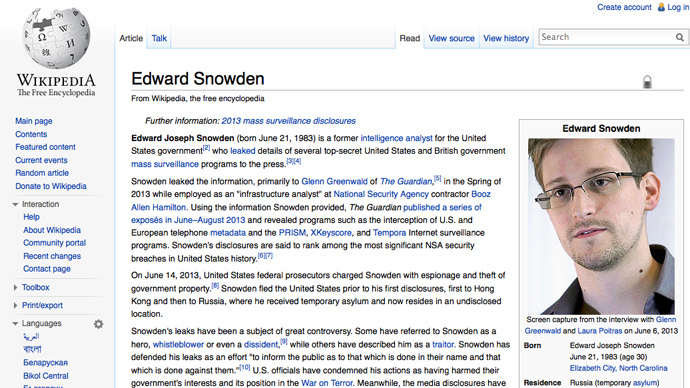 Last Friday, someone from inside the parliament logged on to the Wikipedia site and changed a wording in the biography of Snowden that said American Dissident. The wording now says American traitor as it was first appointed out by Joe Klock of Daily Dot Website. Joe also pointed out that the revision to the profile came from some computer that is connected to the internet that is being used inside the senate building of the US. The change of word only remained at the page for about a minute or so but caused a lot of stir. The Wikipedia editor has made confirmation that the change in wording was made by someone who had an access to some computer inside the senate building. The editing was carried out from a computer with an IP that belongs to the US senate. The change was however removed in just a minute because it was not from some neutral source and it is against the 5 pillars that run behind the operations of Wikipedia. The post said that Wikipedia has conducted in the manner it is required on its part but has been so quick in doing it. Pointing out or nailing the person behind the edit is much too difficult because though the IP belongs to the senate but it does not belong to a single user. Well it’s still a question that whether someone would want to carry out any serious investigation about who made the change but it’s not impossible. Klock has indicated that the IP registered with the senate has been utilized many times in the recent weeks to carry out other revisions as well e.g. the editing on the page about the novel with title 5 people you will meet in Heavens and the edit on the page of Tiki bar that is located inside a hotel in San Francisco. A good share of critics is already on Snowden at Capitol Hill. The Bi-partisan senate Committee discussed the issue on Snowden last month and the committee has voted unanimously that the state Department should consider posing sanctions on countries that are willing to give assistance to Snowden as he struggles in his battle of escape from the US government. Sen. Lindsey graham who is the author behind this Bill has said that it is not certain that whether he would be staying in Russia forever and neither is it certain that where will he go if he leaves Russia. What I know is that he should be sent back to home so that he can counter the charges for crimes he is known to have allegedly committed. Sen. Graham has also previously said that US should be boycotting Sochi Olympics that are about to held next year if Snowden remains in Russia. Russia has granted him asylum for a year. A senior senator of USA on hearing the news of the asylum has said that it is a disgraceful response from Russia and they are doing it deliberately to embarrass USA. The senator has also said that this asylum is like a slap on our faces and we should now consider revising our terms with Russia. It is an established fact that though Snowden is hated among many lawmakers of the US but there are still many higher officials and retired lawmakers and senate members who have praised his act of revealing the truth that is related to the violation of US constitution. An Ex- republican senator has even wrote a thanks giving letter to Snowden on revealing the blunt truth. The executive branch in US is still not sure about how to cope with this issue. It is expected that the White house will make a decision in this week about whether President Barack Obama would go on with his plans to do a meeting with the Russian President.